Buck Oowatie, a member of the Cherokee tribe was born at Pine Ridge, Georgia, in 1800. Educated by missionaries he learnt to speak English. In 1818 he journeyed to Washington where he had a meeting with Thomas Jefferson. 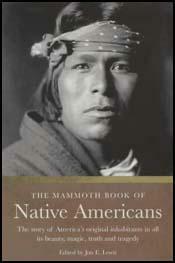 He also met the writer and politician, Dr. Elias Boudinot, who offered to do all he could to help the Cherokee nation. In return, Oowatie decided to adopt the name Elias Boudinot. Soon afterwards Boudinot announced his engagement to a white woman called Harriet Gold. This created a great deal of anger and an effigy of Harriet Gold was burnt in the town square. Despite the outbreak of racism, the couple married in March 1826. Boudinot and his wife moved to New Echota and worked closely with the missionary Samuel Worcester. The two men became convinced that the Cherokees needed their own newspaper. This was now possible as Sequoyah had just completed the development of Talking Leaves, a graphic representation of the Cherokee language. Worcester raised funds to build a printing office and with the help of Boudinot, began publishing Cherokee Phoenix in February 1828. Boudinot became editor of the newspaper and his wife ran the local school. Boudinot also created a hospital and a Christian mission in New Echota. At first Boudinot argued strongly against the 1830 Indian Removal Act. However, his views gradually changed and in 1832 he argued that removal was the "course that will come nearest benefiting the nation". As a result of this new stance he was forced to resign as editor of the Cherokee Phoenix. In 1835 Boudinot, Major Ridge, and 18 other members of Cherokee tribe signed the Treaty of New Echota. This agreement ceded all rights to their traditional lands to the United States. In return the tribe was granted land in the Indian Territory. Although the majority of the Cherokees opposed this agreement they were forced to make the journey by General Winfield Scott and his soldiers. In October 1838 about 15,000 Cherokees began what was later to be known as the Trail of Tears. Most of the Cherokees travelled the 800 mile journey on foot. As a result of serious mistakes made by the Federal agents who guided them to their new land, they suffered from hunger and the cold weather and an estimated 4,000 people died on the journey. On 22nd June, 1839, Elias Boudinot was stabbed and tomahawked to death by a group of Cherokee warriors who had been opposed to the signing of the Treaty of New Echota.